Injustice #26 is about chess - literally and metaphorically - with the action of the issue centering upon two debates. 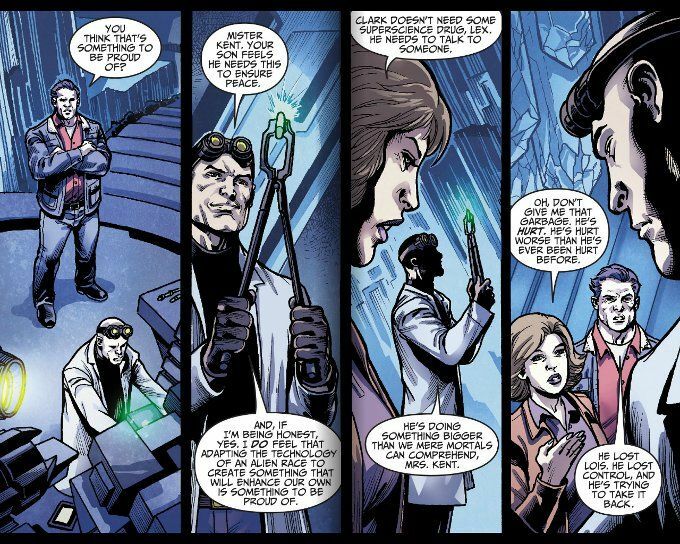 In the first, Lex Luthor - having just created a pill that can temporarily give an ordinary human the strength and durability of a Kryptonian under Earth's sun - argues with The Kents over Clark Kent's state of mind and the necessity that, some day, some one may need to use Luthor's creation to stop Superman from going over the edge. The second subplot centers upon Superman and The Flash, giving a whole new meaning to the term "speed-chess" as they play a few games at super-speed while arguing over where they draw the line in their efforts to provide security for the people of Earth. Writer Tom Taylor does an amazing job of taking the dark setting of Injustice and expanding it into something that is uncomfortably like the classic DC Universe we know and love. 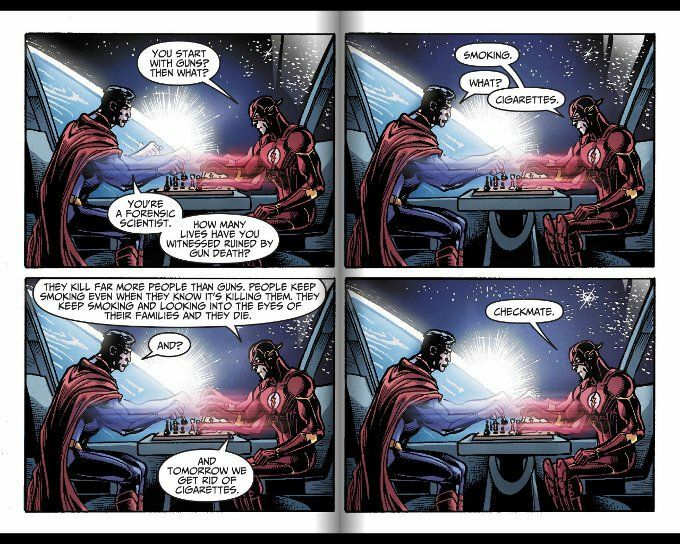 Superman and Flash playing chess at super-speed is the sort of thing one would only expect to see in an old Justice League of America issue yet Taylor makes the conceit and the obvious symbolism work. The interaction between Lex Luthor and The Kents is nice too, leading me to wonder if this was a universe where Clark Kent and Lex Luthor remained friends after Lex left Smallville to seek his fortune. Despite this issue lacking any big action sequences, artist Tom Derenick keeps things interesting. One wouldn't think a series of panels depicting two people playing chess could be exciting - particularly when the only hint of movement in the background is a slight change in the position of the character's arms and a minor shift in the light reflecting on the window. Somehow, Derenick manages this feat with surprising subtlety and the artwork elsewhere in the issue is similarly skillful.